Being Frugal and Making It Work: Holiday Gift Guide Giveaway Ending Tonight: Inspirational Mugs - 5 Winners! Holiday Gift Guide Giveaway Ending Tonight: Inspirational Mugs - 5 Winners! 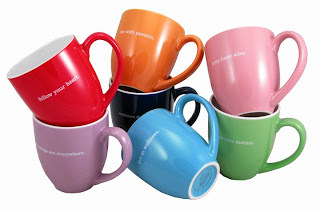 Give the gift of encouragement and inspiration this year with a bright, colorful bistro mug! Each inspirational coffee mug comes with a message of support! You choose the message and the recipient! "Love without Limits," "Learn to Laugh," "Live with Passion" or "Follow your Heart..."what would your inspirational message say?